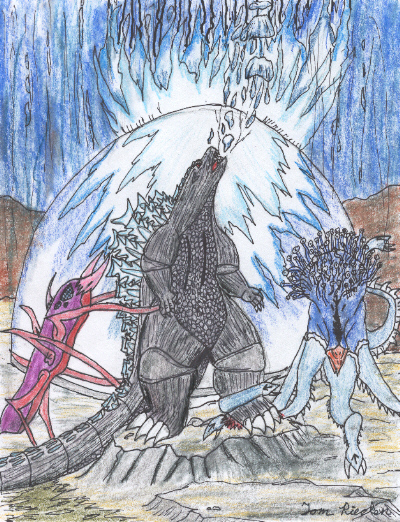 Will Godzilla save the world? "Nearly everything we need to save this blind planet is outlined in here. It contains all the secrets of the empire of Mu, including the one that may just save the world from what they called the Eye of Heaven." "The muscle movements betrayed its dreams of subduing deepwater prey, destroying mans cities and waging epic struggles with giant apes, monstrous moths and a triple-headed, golden dragon from a distant galaxy."